Window benches should save space in your new home, not eat it up. Built-in benches provide extra seating, and can be used to store bulky items such as throw blankets and pillows. 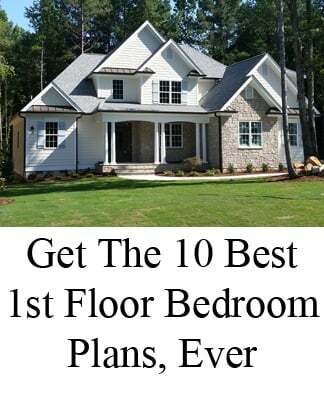 See photos of Chapel Hill custom homes with built-in window benches - some with "secret" storage hidden below and other designed as casual seating spaces. 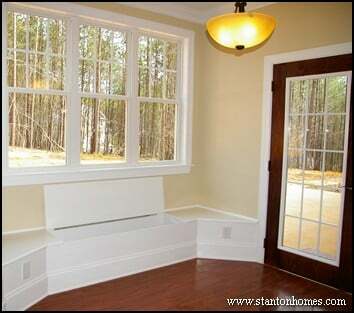 This storage bench is tucked to one end of the sunroom. 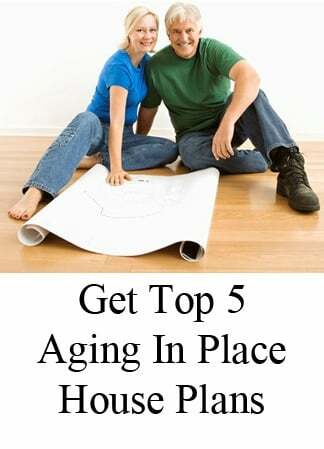 It is small, discrete, and adds a large amount of stoarge to the surrounding areas. 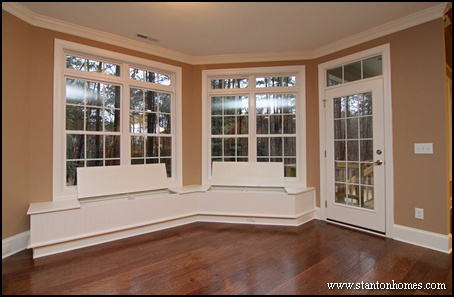 A bench wraps around two walls in this breakfast room, just around the corner from the sunroom. You could add a table, and use the bench as seating. 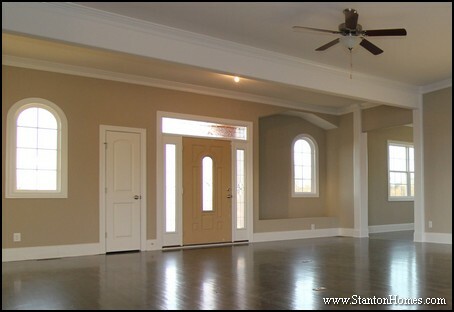 Or you could use a smaller table in the center of the room, with separate perimeter seating. 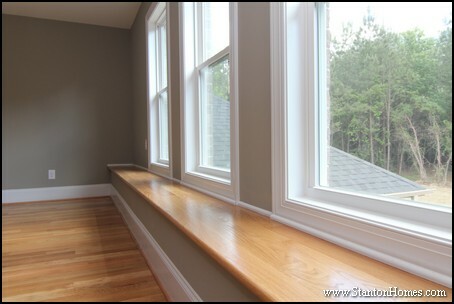 Here is another view of this window bench - so you can see how well it works with the island kitchen. Each bench compartment is divided into two spaces - for more organized storage. 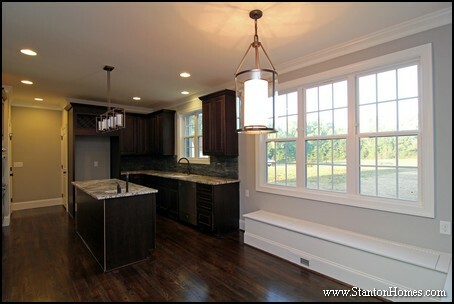 The fronts of these benches are built with a beadboard design and accent trim, to achieve a more upscale feel beside the executive kitchen. 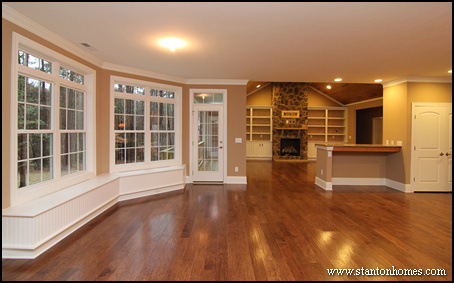 Built ins define this open concept space - with a desk, bookcases, and cabinetry punctuating each room. 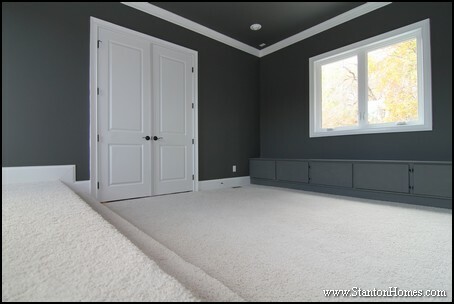 These storage benches open from the front, rather than top, and are designed for kids to use in this media room / play room combination space. Side-opening benches can be a great alternative to top-opening benches, depending on how you wish to use the space. 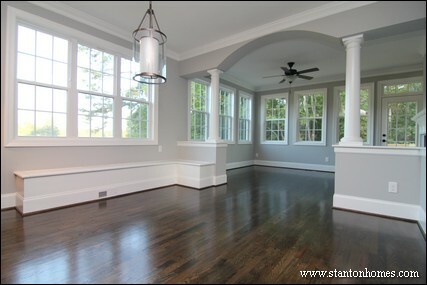 In this Chapel Hill custom home, the full-length window bench in the bonus room has an oak seat. The bench adds tons of seating, without forgoing square footage. 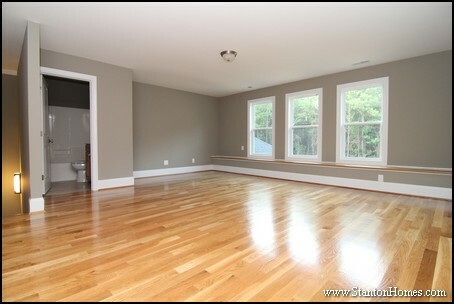 The rest of the room is flexible - you can add a pool table, entertainment center with lounge chairs, or game table. 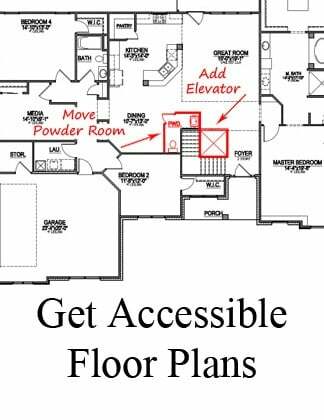 A custom window alcove offers bench seating, and a nearby tucked-in coat closet offers convenient storage. This built in bench takes advantage of the space created by the French Country exterior, with one wall extending forward. 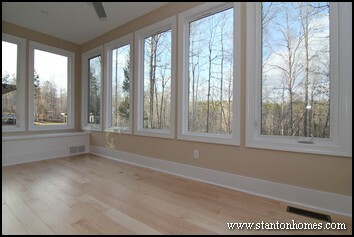 While some window benches are designed to blend in - like the oak bench above - others are designed to define the space. 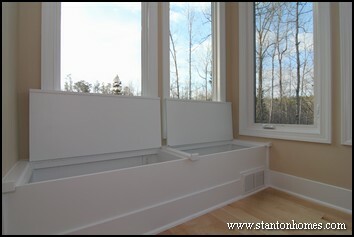 Here is an example of how to add a storage bench to an angled room - where the seating wraps around. 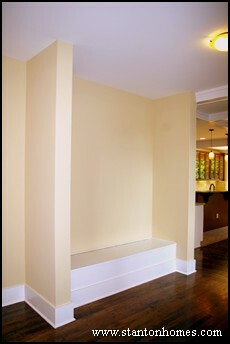 Built in benches can be placed almost anywhere - from under the staircase to a hallway wall. 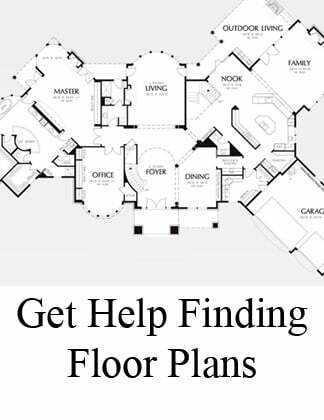 Your builder can give you some great ideas for how to stack, place and arrange them to suit your needs, best.